(06-04) 20:58 PDT SAN FRANCISCO — In San Francisco, a city that prides itself on a progressive attitude toward marijuana, authorities have been arresting fewer and fewer people for pot possession. But African Americans are arrested at far higher rates than whites, according to a report released Tuesday. The report by the American Civil Liberties Union, which analyzed federal arrest data, found that black people in San Francisco were 4.3 times more likely than white people to be arrested on the charge in 2010. The disparity was twice the state rate and slightly higher than the national rate. The divide in marijuana arrests – which the ACLU attributed to a “staggering racial bias” – persisted even though black and white people have been found to use pot with similar frequency, the report concluded. It questioned the high cost of marijuana enforcement at a time when Americans are increasingly favoring legalization of the drug. San Francisco Police Department officials did not respond Tuesday to requests for comment on the report. The numbers varied across the Bay Area: In Marin County African Americans were 4.1 times more likely to be arrested than whites in 2010. In contrast, in Alameda County they were 1.3 times as likely to face arrest for marijuana possession as white people. Experts on policing and drug enforcement offered a number of theories on the disparity in San Francisco, including that police officers target enforcement in neighborhoods that have high African American populations and high levels of crime, like Bayview-Hunters Point. As the core African American population diminishes in San Francisco and concentrates in the city’s southeast districts, some experts said, the group can be disproportionately affected by such enforcement. 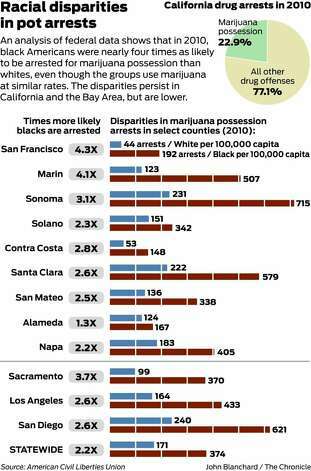 Continue reading at Racial gap in pot busts extends to SF – SFGate. This entry was posted in Criminal Justice System, Injustices and the world we live in and tagged marijuana, Racism, San Francisco, War on Dugs. Bookmark the permalink.